Mary Wright was born in 1827, the daughter of William Wright 1796-1882 of Bradbourne and his wife née Elizabeth Gould 1802-1843 of Hanson Grange. William Wright 1796-1882 was the son of John Wright (1752-1840) and his wife Elizabeth (1761-1844). In 1852 Mary Wright was married at Bradbourne church to Nathaniel Gould 1824-1874 a tea merchant in Manchester. They were third cousins, both being great-great-grandchildren of William Gould 1677-1772 of Pilsbury Grange and his wife née Anne Morewood 1679-1749. Years later an old lady still recalled that "Miss Mary was the loveliest bride of all, that she was!" (1). After their marriage, Nathaniel and Mary Gould set up home at 27 York Street in the northern Manchester suburb of Cheetham. There, on 21 December 1857, during the Christmas rush in the tea trade, Nat Gould was born. "I was a weakly infant, and had a desperate struggle for existence; in fact my case was considered wellnigh hopeless until three years of age" (2). Mary Gould herself was never in full health. Nat Gould proved to be a wayward child and youth, failing to settle to steady work in the tea trade, and getting into bad company. His father died suddenly in 1874, and thereafter Mary Gould had to deal with him alone. He was a sore trial to her, and she finally decided that they should leave Manchester. In 1877, Nat Gould went to work in Newark as a journalist, Mary Gould accompanied him, although he nowhere mentions it in his writings. While living in Newark, Mary Gould made her Will dated 29 July 1881, naming Nat Gould and her brother William Wright 1826-1904 executors and trustees. She bequeathed £100 to her brother William Wright 1826-1904, the Bradbourne farmer Uncle Will of whom Nat Gould wrote so graphically (3). In the Codicil she set up a £500 trust fund for her infant granddaughter Doris Isabel Gould. 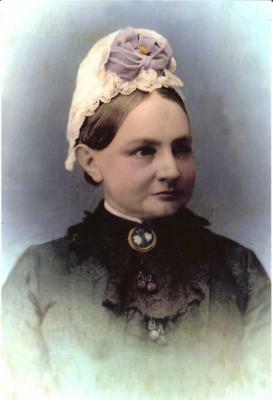 She was Nat Gould's elder surviving daughter, who had come to England with the family as a tiny baby and had been christened at Mayfield on 13 September 1895. Why Mary Gould called her infant granddaughter Isabella is unclear. Nor is it known why she provided a trust fund only for Doris, and not for her two older brothers Sidney Nathaniel Gould and Herbert Ruska Gould (4). After Nat left for Australia in 1884, Mary Gould moved from Newark to Southport, Matlock and finally Derby. When she wrote the Codicil to her Will on 11 December 1896 she was living in Friar Gate in Derby. She died six weeks later (5). From 1887 Mary Gould kept a Birthday Book in which she entered the days on which members of her family were born. The book provides information not otherwise known. Years are not given, but they can be found elsewhere. "It was a melancholy ride, cold, and the roads were slippery. A halt was made at Ashbourne, where the coaches joined us. Along the road to the bottom of Bradbourne Hill it was not so bad, but up the steep lane to the church the snow had been cleared away until it stood many feet high, like a wall, on either side of the road. The black horses and coaches afforded a sharp contrast as they went up the hill. The best of mothers, the kindest of friends, sleeps peacefully in that lovely old place, in the heart of the village where she was born, close to the church in which she was married" (6). (1) The Magic of Sport page 211. (2) The Magic of Sport page 1. (3) The Magic of Sport pages 36 to 64. (4) Presumably she thought that they would manage for themselves whereas a girl might need money of her own. (5) Friar Gate is still a street of elegant eighteenth century houses in Derby, now mostly professional offices. Which house was the home of Mary Gould is unknown. (6) The Magic of Sport pages 210 to 211.